SANTA CLARITA, Calif – The William S. Hart Union High School District needs two new members of the Measure SA Citizens’ Oversight Committee. These members will serve a two-year term with a maximum of three consecutive terms. SANTA CLARITA, Calif – Bowman High School will be celebrating its 50th anniversary as a school within the William S. Hart Union High School District on Tuesday, March 19, 2019, at 6:30 p.m. 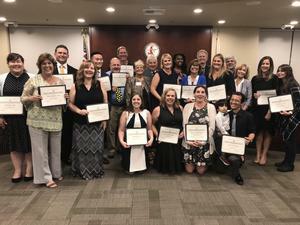 The William S. Hart Union High School District Governing Board recognized its 16 Teachers of the Year for the 2018/19 school year Wednesday. SANTA CLARITA, Calif – Four students from Valencia High School's Medical Sciences Academy traveled to Washington, D.C. to partake in the HOSA Washington Leadership Academy for future health professionals. 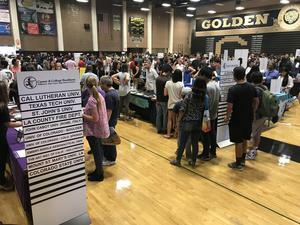 SANTA CLARITA, Calif – An estimated 4,000 students and their parents attended the 2018 College & Career Fair at Golden Valley High School. The 8th annual event is put on by the Career & College Readiness department of the William S. Hart Union High School District. 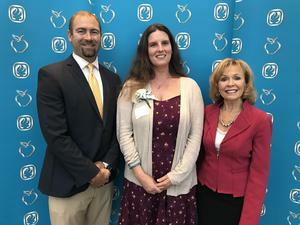 SANTA CLARITA, Calif – Over 500 teachers, administrators and supporters gathered at the Universal Hilton Friday to honor the Los Angeles County of Education’s Teachers of the Year. Including Hart High School Biology teacher Erica Hardbarger. SANTA CLARITA, Calif – California Secretary of State Alex Padilla stopped by Golden Valley High School Wednesday morning to encourage students to register to vote. SANTA CLARITA, Calif – The William S. Hart Union High School District needs a new member of the Measure SA Citizens’ Oversight Committee. This member will serve a two-year term with a maximum of three consecutive terms. 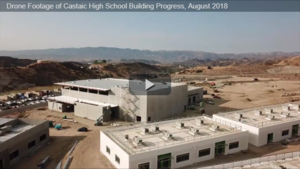 Drone video footage of the Castaic High School building site taken by Castaic High School Construction on August 4, 2018.